13th November, 2013, Miao: The Women Commission of the Diocese of Miao organized a Diocese level Women Convention in three places in the Diocese to promote the Year of Faith and help the women to become the agents of Faith. The Women Commission, under the leadership of Sr. Rosamma, the Women Commission coordinator, planned well in advance to help the women in the Diocese to be a part of the Year of Faith Promotion in the Diocese. To make it convenient for all the women in the Diocese, convention was organized in three different places on different dates. For the women group in Tirap District, the three-day convention was organized in St. George’s Parish, Deomali from 25 to 28September, 2013. There were about 220 women from all the Parishes in Tirap District participated in the event. Sr. Ememlda, the women coordinator of the Diocese of Dibrugarh and Sr. Sandra animated the women on the first day with input sessions and sharing. On the second day, the Divine Retreat Team from Margherita led by Rev. Fr. Varghese VC animated the women to help them become stronger in their Faith. Fr. CC Jose, the Rector of the Minor Seminary, Miao was the main celebrant at the concluding day Holy Mass on 28th September. Speaking to the women group, he emphasized the fact that women in society play an important role in its progress and growth. “You have the power to change the society”, he said. The women convention for the women group in the Lohit and Changlang District was organized in Kumari Parish from 11 to 13October, 2013. 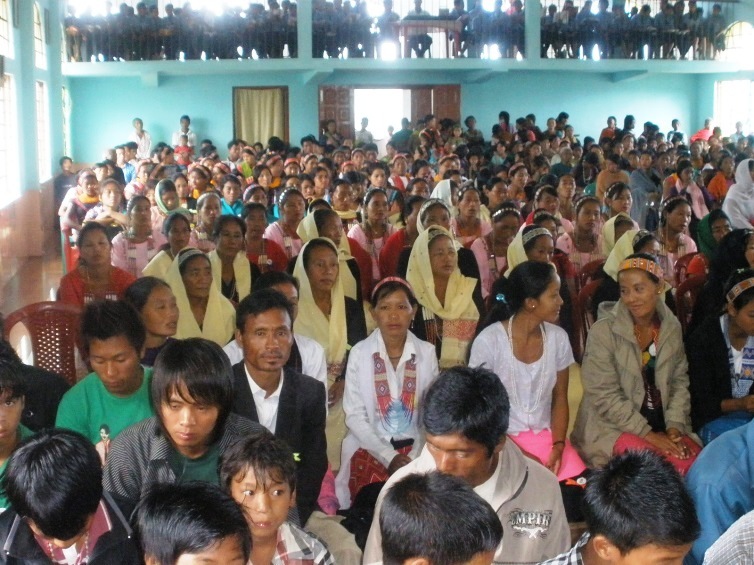 There were about 200 catholic women from the Districts of Changlang, Lohit and Dibang Valley. Bishop George was solemnized the event on the concluding the day with a very solemn Holy Eucharistic celebration. “Women in the Bible have played a vital role in God’s plan for salvation of all mankind. Just as Mary’s one ‘Yes’ changed the world, you can also change your village, and society at large”, he said, while speaking to the women on the occasion. The third women convention was held in St. Joseph’s Parish, Minthong from 25 to 27 October 2013. Rev. Sr. Anna MSMHC animated the women to realize their Spiritual, Mental and Physical make-up. Rev. Sr. Rosamma spoke to the women on the topic, women can work wonders. Sr. Pramila MSMHC from Naharkatia was also part of the animation team that guided around 250 youth from all over Longding District.